If there is one thing that coastal South Florida is known for (aside from the awesome weather), it�s the amount of boats that call this place home. You can�t go anywhere in the Spring and Summer seasons without seeing tons of boats out on the water enjoying the beautiful weather. But what about boat care? They�re painted and protected too, right? Shouldn�t boats have dedicated products to care for their exterior surfaces as well? Yes, they should � and that�s why Marine 31 was created. The creation of Marine 31 was no easy feat. Venturing into the world of boat waxes, gel coat polishes, and boat UV protectants (not to mention specialized metal coatings and polishes and plastic windshield cleaning products) was something the chemists behind Pinnacle Natural Brilliance, BLACKFIRE Car Care and Wolfgang Concours-Series was not used it. They had to go back to the drawing board and school themselves on what makes a world-class marine quick detailer, gel coat oxidation remover, odor eliminator, all-in-one gel coat polish, best boat wax and more. Two very important requests were made during the manufacturing process of this marine line - the line had to be harbor-safe and eco-friendly while outperforming any existing marine care product. Hard to use marine car products and anything that would harm our beautiful waters were not to be a part of this, and Marine 31 can confidently proclaim the opposite of both. 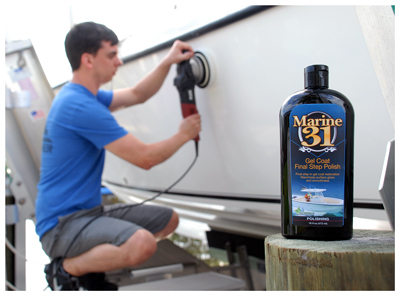 Marine 31 has been in the making for over seven years and the ease-of-use and performance of each product is a testament to the strenuous research and development put into this unique line. We can say without hesitation that every Marine 31 product is the best that each respective category has to offer. We�ve personally tested each and every product in the Marine 31 line and we�re proud to say those test boats have never looked so good! Need Help? Call Toll-Free 1-877-797-8803 to speak to a customer service representative.